Discussion in 'Off-Topic' started by super71, Oct 18, 2018. Good thing Mexico’s allowed to enforce their immigration laws, it’s a shame how the United States never can without everyone *****ing at us. We need to do more helping these people in their own country, the rate we’re going the United States will be a 3rd world country in another generation. Why are they traveling 2,000 miles to come to the United States ? Their isn’t anywhere in between they could go ? It’s sad to see for the women, elderly and children, but I fear the trip itself is actually more dangerous than where they live to begin with. When they get to the border are they going to say they are being separated, knowing they walked 2,000 miles with the possibility of that happening ?Most say they are leaving from gangs and poverty, where are the police in these countries ? Why aren’t they attempting to fight back against said gangs. Why are their governments failing them so miserably that it’s everyone else’s problem ? Isn’t this what nato is Firking for, to defend countries that can’t defend themselves ? GANGS, not a rival military, or a communist country. Gangs ?For ****s sake, the United States police force can handle gangs. We have almost a million cops in the United States, the problem is these countries are even more corrupt than the United States is, and their people in power are worse. Taking in all these refugees when we have no idea who they are, can lead to those gangs coming to the United States or Europe, which a lot of them already have. We need to help these people, but bringing them all here, and their way of life here is hardly a good way to help anyone. it’s a shame how the United States never can without everyone *****ing at us. This isn't really true. The US takes in far fewer refugees than other developed nations as it is relative to its own size and population. Part of that is geography, but another part is that the number of refugees the US is allowed to take in is set by Congress. You can see here that the number of refugees being accepted recently are relatively low. 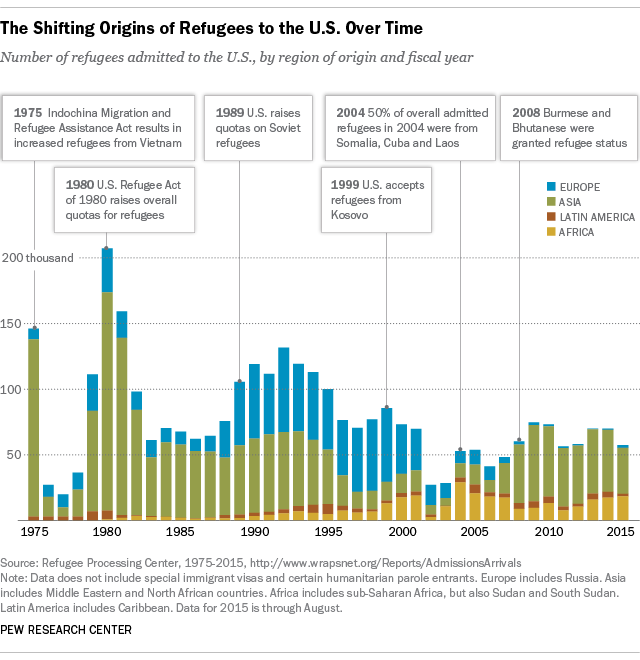 And that from Latin America specifically has also been a relatively small part of the total number of refugees the US has taken in over the years. 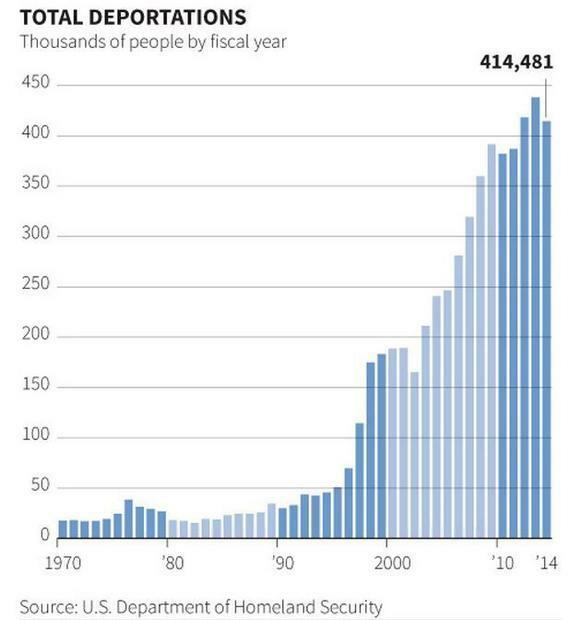 The Obama Administration presided over a substantial increase in deportations as well, continuing an increase that started in the mid 90s (this is technically illegals, not refugees specifically, though some would be people attempting to seek asylum, so there's some overlap). You may not be aware of this, but under President Obama, Mexico and the US entered into an agreement for Mexico to help deport migrants before they reach the US. As a result, Mexico's deportations of such migrants has substantially increased in the last few years, and a result, migrants reaching US borders has decreased. "Mexico deported 79% more people from Central America’s northern triangle in the first four months of 2015 than it did during the same period a year earlier, according to government statistics. Data from Mexico’s National Immigration Institute says that 51,565 immigrants from Guatemala, Honduras and El Salvador were deported between January and April, up from 28,736, during that period in 2014. Deportation of Guatemalans rose 124%, followed by Salvadorans at 79% and Hondurans at 40%. The Inter-American Commission on Human Rights on Wednesday expressed its “concern over stepped-up actions reportedly being taken against migrant persons” that were put in place after Mexico initiated its Southern Border Plan last year under pressure from the United States. In 2014, more than 46,000 unaccompanied minors from Central America crossed into the United States, leading the US government to turn to the governments in Mexico and Central America to try to staunch the flow." In other words, this isn't anything new. Though when this happened under Obama it got far less attention - but then, Obama didn't boast about that kind of thing either. The US has also recently pledged $20 million to continue to drive such efforts in Mexico. Most say they are leaving from gangs and poverty, where are the police in these countries ? Why aren’t they attempting to fight back against said gangs. I don't know how to explain it to you... the American experience is generally not conducive to understanding these types of issues. You have no frame of reference. But a large part of what makes the gangs powerful is that they are the de facto government. In places like these, the government itself is either weak and/or corrupt, if not outright non existant - and the police force along with them. To call them "gangs" is... in some ways a misnomer, they are not like the gangs in the US. They are organized crime cartels that control most aspects of the country. You literally cannot accomplish anything without their blessing. When you see a police officer, there are 2 options: 1) it is a corrupt cop, or 2) it is not even a real cop, but a "gang" member dressed as one. It's somewhat easy for those living in situations and a place where they have choices, freedom of speech, and other liberties to imagine what they might to do to "fight back" if there is a rise of gang violence because you have institutions you trust. But these people do not have such institutions to rely on. Why it has become this way is a whole different discussion, but I will put the thought onto you that many of these regions that have extreme instability such as Guatemala, the home of the Boko Haram (Nigeria) or South Africa, have all been, at one time or another, subject to European occupation and exploitation, or interference from First World countries in one way or another. When the occupiers left or allowed them to have independence is when a power vacuum is created... this is a simplistic and generalized view, of course, but it's also one that has played out in many places over the years. As for whether countries SHOULD take in refugees, that's certainly a tough question, and a morally ambiguous one. And both sides have reasonable arguments. Geressen and SPiEkY like this. Why are their governments failing them so miserably that it’s everyone else’s problem ? . one of life's mysteries I suppose. not a rival military, or a communist country. Gangs ? the problem is these countries are even more corrupt than the United States is, and their people in power are worse. It's almost like overthrowing democracies that ellect socialists and funding corrupt right wing authoritarian rebellions is a poor long term plan for stability. but I guess whomever was dumb enough to enact such plans will have to take responsibility for it don't you agree? I’m really liking how this one is playing out. It seems that there may be over 7000 people in this latest group. I especially like the video of people handing out money as they go through the Guatemalan border. And although it’s 90% men ages 20 to 40 let’s be sure and put the few women and children right out front for a good photo op. This is some good entertainment. Soros really should’ve planned this better. If he could have had the caravan at the border already a month or so ago have the US military blocking them and having them start to starve and die on the Mexican side then the dems would probably get some favor out of it. But as it is they’re just stroking the fears that the Republican side is already put in place and validating that. And the caravan won’t even get here in time to do anything other than that. Maybe they’ll just put them on buses and help them get through Mexico more quickly. I actually even quoted in that old article that Honduras government was probably too corrupt for the people to change anything. As for privileged, sok bud I’m glad you think you know me it’s counter productive and funny, but to each his own. Quick question sok, is their were 5,000 Russians trying to cross the United States border, and saying we are too many to stop, what would you think should be done, let em all in ? You won’t get that scenario, so here’s another. Sok, what if you live 3 miles from that border, and 5,000 people you didn’t know were gonna come live in your neighborhood, with or without your consent. A few decades ago we would have considered this a military invasion, now instead of sending these people back you want them to come here so legal citizens can pay out of their pockets for everything they do while here. Might as well pay isis to move in also. Also for heavens sake do a little check into who owns all these liberal groups and who pays for everything they do, or ask why they are coming here and not somewhere else. I’m glad you have a different opinion, as it allows me to think about the questions you ask with an open mind instead of just how I view them, however you have never shown the capability to view things from the rights perspective and instead prefer your morale or intelligent superiority from the left. The inability to adapt is a large weakness in most if not all of your arguments. @super71, I moved your post because it seemed like you meant to reply to this thread. Ok, so, first, I apologize if you do have experience with a place like that. Based on your question of "why don't they just fight back?" I assumed that you lacked the context to understand why. I would be interested to hear about your experiences if you feel like sharing. Second, your questions above don't really make sense, because that's not what happens. If these people reach the border - they will have 2 choices. One, attempt to enter illegally, which likely means most will be caught and deported (since it's not like 7000 people are just going to sneak across the border especially when everyone can see they are coming). Two, they can apply for asylum at a port of entry. Note that this is an APPLICATION, it does not mean that the US must take them in. There is a process for this sort of thing and the US sets hard limits on how many refugees it will take in each year. If accepted, they would be resettled in one of the US states that currently agree to take in refugees. In other words, they are unlikely to just randomly show up at a border town en masse. Specifically, most refugees go to relatively few states, with just 10 states taking over half of all refugees in 2016: http://www.pewresearch.org/fact-tan...led-more-than-half-of-recent-refugees-to-u-s/. A few decades ago, the US was taking in far more refugees than it currently does, with over 200k in 1980 as I showed above, so no, it wouldn't be considered a military invasion. or ask why they are coming here and not somewhere else. They do go elsewhere. In fact, refugees coming to the US border in such a fashion is extremely rare. Turkey and Lebanon for example have vastly more refugees. Lebanon has over 150 refugees per 1000 people. The US state with the HIGHEST refugee per 1000 people is... Florida, with just 6. Most US states have less than 1 in 1000 refugees. The current refugee population in the US is 280k. In Turkey it is 3.8 million. The vast majority of refugees do go elsewhere. Finally, note that nothing in reply should be misconstrued as support for open borders. I was simply replying to your notion that the US is somehow unable to enforce its laws when, in fact, it does so and actually quite effectively (and that this effort has stepped up since around 2014 when the US asked for Mexico's help). If I somehow misled you into thinking I support open borders, please do point out where I might have said such a thing so I can re-examine my phrasing. In any case, if you are interested in what I personally think about this type of thing, but let me just say that I am a proponent of strong government doing what it feels is best for its citizens, but issues of this scale is much, much bigger than 7000 people walking. If you want me to expand on that, I would be happy to do so. I would say that I am quite adaptable, but I do admit that I am rigid on facts. I don't believe that you can just make factually incorrect claims like the US can never enforce its immigration laws and get away with it. To me, this isn't an argument, and it isn't a right or left thing. I simply believe it's impossible to have a rational conversation when we don't have start with the same set of understanding of the facts. If you have evidence to back up your claims, by all means, please enlighten me! The problem with your claim that I am not adaptable is that you rarely ever actually give any evidence for the points I counter - you just repeat them as though that makes them true. Thus, my first response in such cases is usually to correct the facts, and provide evidence for why I believe the facts are X or Y. In this case, I believe I showed quite concretely that the US does, in fact, enforce its immigration laws and that refugees do often go elsewhere. You also have a tendency to get extremely defensive when I challenge your factual claims and misconstrue that as me having a certain point of view or opinion (usually one opposite your own). In other cases, such as in the other migrant thread where you claim to ask for information, you are told by our European friends things that differ from your preconceptions, and yet you still cling to them such as the idea of no go zones. In that thread, you claim that crime is skyrocketing and you know why, but when you are challenged on these statistics, you claim that governments lie. Where did you get your information that crime is skyrocketing in the first place and why do you trust that source? How can an honest discussion happen if you don't believe the people who live in these countries telling you that the things you believe are not true? You claim to have "an open mind" but you frequently ignore evidence and sources that are contrary to your beliefs. In this thread, you literally addressed NOTHING that I said except where I explained why they might not be able to fight back effectively. All in all, from my POV, while I feel like I offer a variety of things for you to engage with along with discussion inviting likes "as for whether countries SHOULD take in refugees" and "both sides have reasonable arguments," and you tend to ignore most of it, and just launch personal attacks. Looks like a Bane Shift ton of adult men in that video, carrying the flag of the country they are fleeing from to the United States. Attacking Mexico's fence, attacking the border patrol there, seems to me i'd love to have 5,000 people that give no Firk about any of Mexico's laws, so i'm sure they will come here and be fine upstanding citizens and follow all our laws hahaha. This is very much a military invasion, you can try and disguise it however you want, but think longer term as most countries attacking us would. As I said before let's take out the Honduras population and replace them with 5,000 Chinese or 5,000 Russians i'm sure that changes things real quick. Also I made a post in the other thread because you made a comment and tagged my name for privilege with where I live yada yada yada, more left wing stuff. Anyone that disagrees with you is privileged, anyone that agrees with you is awesome. Simply watch a few live videos about the migrants, it tells you everything you need to know. Pause at any time during that video, and tell me how many women or kids you see. Better yet, let's say 5,000 American went to the Mexico border, we carried our flag to their border, then we shook their fence and attacked the border patrol there, then said were all hard working upstanding citizens and we can't be stopped. What would Mexico call that ? What about the citizens that came here legally, they learned our language adapted to our society, waited years, only to find out that they could have just knocked over the fences and ran right over. If we don't stop this one, what about the next one, or the one after that, where do you draw the line ? Why are these people from worn torn poor regions only fleeing to countries with European heritage when they say were all racist and all privileged ? What have I said that was a personal attack lol, you called me privileged even though you have never met me never talked to me, all I said is you have a one track mind and don't have the ability to adapt on topics. That's hardly as insulting as calling someone privileged with no knowledge of who they are at all. Again form the left, do as I say not as I do. Stones and glass houses all that fun stuff. If you don't want open borders as you say, then what do you think should be done here with 5,000 people walking towards your border ? Check literally any video, it's mostly adult males, with a few kids and women thrown in here and there. They paid almost 19 billion in taxes, while we paid 116 billion. They receive medicare, social security, well fare programs, all while we have veterans living on our streets who fought for the rights the illegals have when they get here, while they wave their flag, and speak their language. If this continues America will be a 3rd world country by 2030, as these people want the free hand outs and have no intention of learning the language or waving our flag ever. The only reason anyone of sound logical mind would want this is if your looking forward to the downfall of America, or your pushing for the nwo. Relative to the people living in places like Honduras, we ARE pretty privileged. My understanding is that the photos being shown for this aren't from this caravan (or even taken this year). But you might be referencing something else. What are you implying by repeating this over and over? Yes, it's mostly men. It always is in these sort of migrations. Because children, especially, can't walk 2000+ miles. Men generally tend to be the first migrants in this type. Of course, in other situations where women and children are fleeing from an extended war, the demographics might be different, but they would also just be fleeing to anywhere they can (which usually means a neighboring country rather than having a specific destination in mind). But in the situation we are talking about, it'll tend to be men. Even when my family emigrated to Canada, my dad went first to ensure he would find work and find us a safe place to live - and this was from Hong Kong to Canada via the immigration (not refugee) process. I'll tell you what, if this caravan was all or even mostly Women and Children, I'd be FAR MORE skeptical about it. Because that would make very little sense. Refugees in GENERAL have women and children. Refugees travelling thousands of miles? Mostly young adult males. You stop them at the border like you are supposed to. And if you have a Refugee program as the US does, they can apply for asylum and be processed like ANYONE ELSE who comes to a valid port of entry. If they have committed crimes on their way here (or back home), then they won't be allowed in. But if they fit the criteria and are vetted, then they would become legal refugees. I don't understand why this is controversial. It's literally the current legal process under US law. The US has policies and procedures to handle this type of thing that are dictated by its own laws - so just follow them. Recruiting Mexico's help to stop them is also valid (and as I said, Obama is the one who started that in 2014). But they are also under no obligation to do so either. If they want to help, they can. The US (and any other country) has the right to enforce its borders and laws, and decide for itself whether it wants to take in refugees. Current federal law (Refugee Act of 1980) allows Congress (in consultation with the President) to set the number of refugees they will accept. This can also be paused temporarily at any time as Bush had done after 9/11. The entire point of government is to do this sort of stuff. Would it be nice to be able to help everyone? Of course - and I believe both the people on the left and the right want to help people generally (the difference is mostly in the how). For example, my inlaws (who are extremely conservative) makes sandwiches every weekend for the homeless, another conservative friend of mine travels a lot for work and she collects all the hotel shampoo and such and makes hygiene bags for women's shelters. I also feel that taking in refugees is basically plugging a leak in your garden hose while the faucet is opened all the way. It's a short term solution. The global refugee crisis is not really a problem any one country can solve. I don't believe there's the political will to actually fix it globally at this time, and even if there was, it'd be extremely costly and not guaranteed to work. But as long as the problems remain, there will be refugees and lots of them. Keep in mind that this paper is about ILLEGAL immigrants, not legal ones. If this caravan arrives at the border at a valid port of entry and applies for asylum. Any that are accepted after vetting will be here LEGALLY. I absolutely agree that from the perspective tax dollars, illegal immigrants do cost the country (though it's muddier when you consider other factors). But we are taking about refugees here and applying for asylum is NOT illegal. We should not conflate the two groups. Now, is it possible this caravan tries to enter illegally instead of applying for asylum? Sure, but as I said, it's unlikely 7000 people can make that way when everyone knows they are coming. - I worry about a time when people aren't fleeing from "potential" harm... that they are fleeing from a total lack of resources to survive. Then you will see what the human survival instinct is capable of... I worry for the future if we keep pretending borders and imaginary lines on a map somehow stop the drive to survive. Right. This is why the proper solution is to think long-term and how to create societies and sustainable institutions across the globe. If the US wanted to stop immigrants from the South the easiest and quickest sollution would be to invest in Mexico untill it was economically strong and equally wealthy. are you sure it's that simple? I said quickest and easiest. I mean the investments could easily fail and even if they don't, it's not like economic growth will solve all problems there. ah but you've not grasped the beauty of it, the other problems are obstacles to the investments and growth, so they will have to be solved, and though that is difficult it is still the easiest and quickest long term sollution to the problem. or you can just keep fighting the results and call that the sollution, like instead of stopping a mad stabber by removing the knife you just continue to patch any stab wounds. it's US' call. You support whatever is fashionable this week, and in another thread said you support an open border policy, which is completely ridiculous and idiotic and explains why you support thousands of illegal migrants coming here. You agreed migrants are an economic drain, and then think an open border policy is a good idea ? How would taxes work with open borders around the world, who would pay for all the people who don’t work, who pays for their children’s college, medical, housing ? How would governments work or run ? How would militaries work, would we still need one ? This to me sounds a lot like a new world order comment, with one government, one currency etc. People with your sort of radical thinking are why America is falling behind and failing. All these ideas, but no clear cut way on how to implement them, or any common sense to see how it would impact everyone. You have a either a very very dangerous mindset and should probably take those ideas elsewhere, or your under the misguided impression everyone would just get along and co exist. Granted I’m all for the second option, but I have enough common sense to acknowledge how ridiculous that idea is. You seem like a smart dude, but you seem very naive about how the world is. A lot of privilege like this typically comes from a person being in a safe and economically sound environment. Also again you’d be naive if you didn’t believe someone was talking in all these migrants ears and telling them we had to take in all asylum seekers, which is also a false statement. The persecution was because of his/her race, religion, nationality, political opinion, or membership in a particular social group. Don’t see anything about gangs and poverty there, do you ? You could say that they could be labeled as a poor social group I suppose, however a ton of people in America could say the same and we wouldn't be expected to be accepted in Europe because we don't have money or opportunity. They have also been offered jobs and safe haven in Mexico which voids there asylum seeking in the United States for fear of poverty and gangs, which by law you can’t even seek asylum for. Do some homework bud, all of you liberals should. Your not loyal to the United States and never have been, it’s been very clear from the get go. "Actually, I wasn’t going to take questions, but let me just respond to this particular question because I felt like some of the stories were a little over cranked. And as I explained to my fellow Presidents, under U.S. law, we admit a certain number of refugees from all around the world based on some fairly narrow criteria. And typically, refugee status is not granted just based on economic need or because a family lives in a bad neighborhood or poverty. It’s typically defined fairly narrowly -- the state, for example, that was targeting political activists and they need to get out of the country for fear of prosecution or even death. "There may be some narrow circumstances in which there is a humanitarian or a refugee status that a family might be eligible for. If that were the case, it would be better for them to be able to apply in-country rather than take a very dangerous journey all the way up to Texas to make those same claims. But I think it’s important to recognize that that would not necessarily accommodate a large number of additional migrants. What’s more important is going to be for us to be able to find the kinds of solutions, both short-term and long-term, that prevents smugglers from making money on families that feel desperate; that ensure that we’re creating greater security for families in Central America, and that we are helping to grow opportunity long-term in Central America and in the kind of legal immigration system that makes this underground migration system less necessary. And that’s what I’m going to be committed to doing." Directly from the left heroes mouth, president Barrack Obama folks. This is my response from another thread base on migration, responding to sok. Any questions ? Those comments were from July 25, 2014, after meeting with Central America Presidents.